Though many Americans enjoy gazpacho and maybe a cold bowl of vichyssoise now and then, soup never really made the roster of popular summertime menu items. 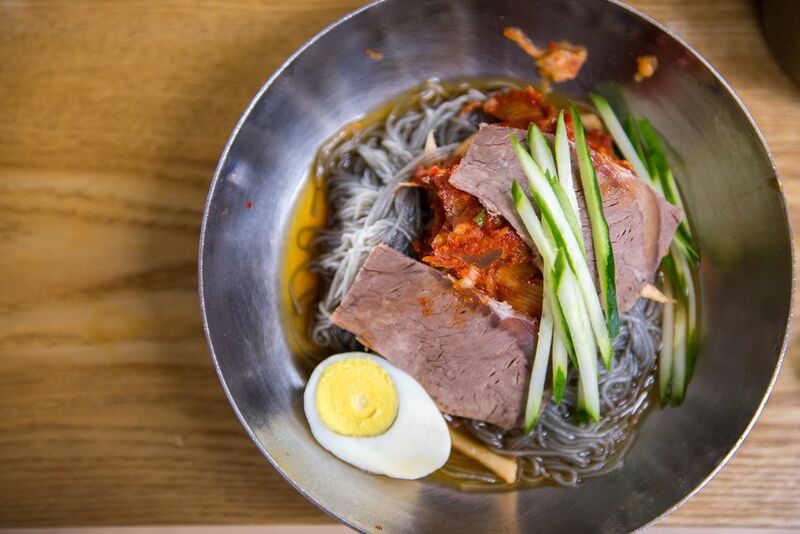 Naeng myun (or naengmyeon), a Korean cold noodle soup with thin, slightly chewy noodles topped with egg, meat, vegetables, and a vinegar-infused ice-cold broth, could be the game-changer. Although Koreans now enjoy naengmyeon as a summertime meal, it came out of the North Korean mountains. Buckwheat grows well in high altitudes, and naengmyeon became a favorite winter dish of Koreans living in the harsh climate. But naengmyeon tastes especially refreshing in hot weather, and it's a one-bowl meal that requires little time at the stove. It's also almost always gluten-free. Though typically made primarily from buckwheat, the noodles may also contain sweet potato, plain potato, arrowroot starch, and even kudzu root (chik), from the often invasive kudzu vine. Look for naeng myun noodles at a local Asian market, or order them online (don't mistake soba or memil gooksu noodles for them). Plan to serve Korean mustard paste, sugar, and vinegar on the side of these Korean cold noodles, since most Koreans like to add them while at the table. Mix the cold chicken and beef broths together with the vinegars. Taste, then add more salt or vinegar as needed. Cover and chill the broth in the refrigerator for at least half an hour. Cook the noodles according to the package directions, or for about 3 to 5 minutes in boiling water. Drain the noodles and rinse them well in cold water to stop the cooking process and eliminate any excess starch. Divide the noodles into two bowls, mounding them at the bottom. Pour a generous amount of chilled broth over the noodles to cover them, then add a few ice cubes to the bowl. Place half a boiled egg, some cucumber and pear slices, pickled radish, and a few brisket slices on top of the noodles. You can use store-bought or homemade broth. If you don't have Asian pear, you can substitute bosc pears. You can also use crunchy apples in place of pears. If you omit the fruit altogether, add 1 or 2 teaspoons of sugar to the broth to compensate for the lost sweetness.